Rüsselsheim. Create a design that combines the attributes of a sports utility vehicle with those of a car designed for the urban lifestyle. That was the challenge facing the designers of the Crossland X, Opel’s cool new crossover that will make its first public appearance at this year’s Geneva International Motor Show (March 7- 19). Together with the all-electric Ampera-e and the new Insignia Grand Sport and Sports Tourer flagships, the Crossland X kicks off the brand’s “7 in 17” product offensive – seven new models in 2017. The new Crossland X lines up in the Opel model range alongside the rugged Mokka X in the vibrant B-CUV/SUV market segment. The designers have therefore created a unique crossover interpretation of Opel’s design philosophy – “Sculptural Artistry meets German Precision” – that reflects the stylish yet functional character of the Crossland X. The Crossland X features the skilled craftsmanship and harmony of shapes and forms typical of Opel design. Signature cues characteristic of the Rüsselsheim brand include the bold grille and the winglets that proudly embrace the Opel lightning flash emblem; the characteristic wing graphics of the headlights; and the blade along each side of the body. The surfaces are fluid and sculptural, with crisp lines of precision, while the chrome trimmed, two-tone floating roof enables a high level of personalization. The high-quality of the overall execution is displayed in the high-tech full LED headlamps, while the horizontal lines that flow around the body combine with the raised taillights to make the Crossland X look wider. The stylish exterior is echoed by the interior design, which enhances the feeling of spaciousness and is complemented by generous storage areas. The influence of the new Insignia and the Astra is clearly visible in the sculptural, driver-focused instrument panel, which flows gracefully into the doors, creating a welcoming ambience. Richly finished decors harmonize seamlessly within the overall design, giving each trim level a distinct personality. Subtle chrome finishes around the cluster and air vents, combined with the soft finishes of the instrument panel and doors, convey a message of quality and craftsmanship. The large, easy to reach touchscreen and the 60/40-split rear seats make the interior of the Crossland X a perfect environment for families. Optionally available are rear seats that slide 150 millimeters to create more legroom or up to 520 liters of class leading trunk volume (which increases to 1,255 liters by folding down the rear seats). Active family lifestyles and functionality are characterized by several rugged SUV cues, such as the protective lower side moldings and the skid plates at the front and rear. 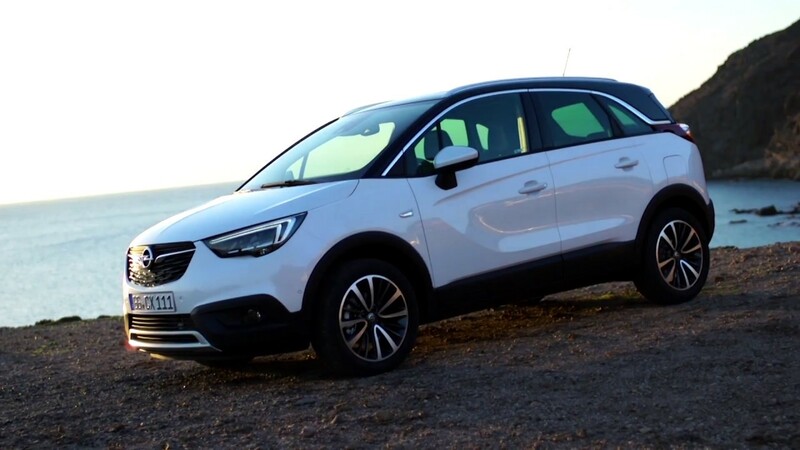 Inside the Crossland X, the driver and passengers enjoy the high seating positions of a typical SUV, in a body that is 16 centimeters shorter but 10 centimeters taller than that of the Astra. Stylish and functional compact cars that are as suitable for short trips to the shops as for longer journeys to the holiday destination are increasingly popular, especially among urban families. This popularity is reflected by the sales in the B-CUV/SUV segment (where one of the bestsellers is the trend-setting Mokka X), which have risen five-fold since 2010. The Crossland X will add further impetus to this booming market and create additional growth for Opel.